Treat Your UnitedHealthcare Patients to Visits Via Telemedicine and Get Reimbursed for Them! UnitedHealthcare is on the cutting-edge when it comes to telehealth coverage and reimbursement. They have had telemedicine reimbursement guidelines in place since the early 2000’s. UnitedHealthcare recognizes the fact that telemedicine is good for patients, good for providers, and therefore good for the healthcare system as a whole. They have embraced the approach as a way to deliver care efficiently and keep patients healthier, thereby cutting costs across the board. Currently, thirty states have so called “parity” laws that require insurance companies to reimburse medical professionals for patient care performed with certain types of telemedicine technology. UnitedHealth, and other private payers are subject to these requirements for most plans. (A few states allow small group plans and workers compensation plans to opt out of telemedicine coverage.) Many states require that telemedicine be reimbursed at the same rate as an in-office visit, while some states leave the reimbursement amounts up to the insurer. State laws vary in terms of what types of telemedicine will be covered, but if there is a parity law, live video visits are covered. In some cases, store-and-forward telemedicine is covered as well. UnitedHealthcare is a telehealth pioneer. It is happy to pay out claims across the United States for telemedicine services for more than 21 million members on individual, employer, and Medicare advantage plans. United sees telemedicine as a way to mitigate what is, according to the American Association of Medical Colleges, a shortage of 45,000 primary care physicians in the US. Plan participants can choose from in-network provider groups that offer telehealth using real-time audio and video technology to obtain a diagnosis and any necessary prescriptions for medical needs, such as allergies, sinus and bladder infections, bronchitis, chronic illnesses, and many other conditions. Of course, coverage must be verified in order to ensure reimbursement, but it is quite likely that your UnitedHealthcare patients will be eligible even if your state does not require reimbursement for video visits. In order to make it easy for you to determine if your UnitedHealthcare patients and others are eligible for telemedicine reimbursement, Chiron Health has developed the most advanced solution for eligibility verification. 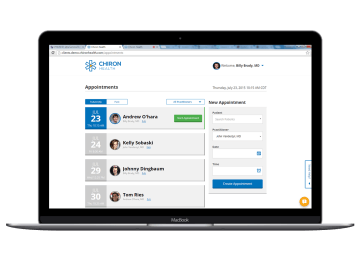 Our Chiron Health Rules Engine® is constantly updated by our team of experts with the latest details on telehealth coverage. When a video encounter is scheduled, the Rules Engine receives the patient’s UnitedHealthcare coverage details and automatically determines if the coverage includes telemedicine. We’re very proud of the Chiron Rules Engine®, but we also realize that great technology is not always enough, especially with the more complicated reimbursement scenarios that come up once in a while. That’s why we are staffed with a talented team of telemedicine reimbursement experts who will work on your behalf to deal with the toughest situations. Your staff doesn’t need to waste time on the phone with United Healthcare resolving a billing issue. We’ve processed thousands of claims and we’ve probably seen something like it with another customer. We’ll help guide your team through the red tape. We’re so confident that our Rules Engine can make an accurate eligibility decision for UnitedHealthcare patients and those with similar coverage, that we guarantee the accuracy of our eligibility verification. If a claim for a visit that we verify is ever denied, we will work with UnitedHealthcare to get it resolved. If we can’t, we’ll reimburse you for the visit ourselves. How can we be so confident? Because The Chiron Rules Engine® and our team gets better and better with every eligibility check we perform and we do it a lot. UnitedHealthcare is way out front when it comes to improving patient health while cutting costs by reimbursing for video visits. Coverage does vary from plan to plan, so it is smart to choose a telehealth technology that will validate coverage for your UnitedHealthcare patients. There are many advantages to telemedicine for your practice and your patients, so why wait?